Outstanding control and ability to switch very rapidly to deadly attacking strokes. With this 4th generation of our outstanding Dr Neubauer SPECIAL blade we have yet again managed to improve the excellent playing characteristics of this product. This exclusive special development from the renowned blade expert Achim Rendler still offers absolutely superb control thanks to its unique construction. It also provides dynamic attacking possibilities: This blade enables you to easily produce high speed and a lot of spin for all attacking strokes. 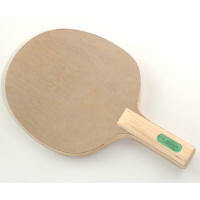 It largely facilitates powerful and effective looping as well as hitting with both reversed rubbers and short pimples. Above all the disturbing effect of this new version is yet again amplified when used with long pimples: maximum spin reversal will be reached while blocking and defending against topspin. Moreover the ball can be placed short over the net to make it very difficult for your opponent to execute his next attacking stroke. At the same time you can attack dynamically and effectively with long pimples through aggressive pushing and lifting. This outstanding product offers brilliant control, maximum disturbing effect with long pimples and the ability to switch very rapidly to deadly attacking strokes. Please note that our 'Special' blade is now also available with flared and anatomic handle. A special version (with different handle, blade size etc.) can be provided for a surcharge.